These were used in medievil torture, on people, when others wanted to get imformation from them. 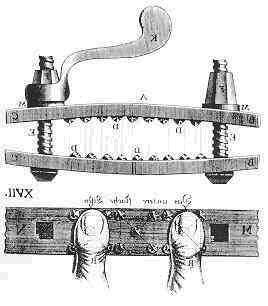 They worked by placing the thumbs into a vice like device like the one above , then the handle would slowly be turned and pressure was put onto the thumbs squashing them. Sometimes there was sharp pointy bits in them that punctured the nail beds, adding to the painful experience. i think that it would not be a nice thing to have done , and i guess that i value my hands to much to crave Master trying them on me ......however i can see where they would appeal to His sadistic side.